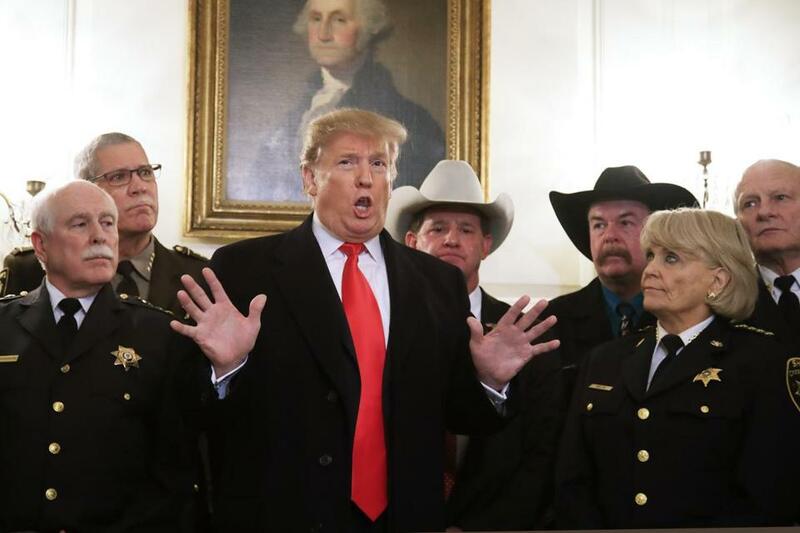 President Trump speaks during a meeting with sheriffs from around the country at the White House on Monday. Psychiatrists Bandy X. Lee and Leonard L. Glass (“Institutional silence on Trump’s mental state,” Opinion, Feb. 7) correctly point out the physician’s duty “to ensure public health and safety,” and they rightly argue that “either silence or active cooperation with a destructive regime” runs counter to “medicine’s humanitarian goals.” But it is a long leap of logic from these admirable principles to the claim that psychiatrists are justified in labeling a public figure “unstable and dangerous,” in the absence of a thorough clinical and forensic evaluation. As an American citizen, I share with Drs. Lee and Glass deep concerns regarding the policies, practices, and pronouncements of the current administration. As a psychiatric physician, however, I am bound by professional standards governing what I can say about individuals I have not personally evaluated. If the American Psychiatric Association’s “Goldwater rule” did not exist, physicians would be morally justified in inventing it. As a forensic colleague and I argued in Psychiatric Times, the rule is not a “gag order” aimed at imposing “absolute silence on its members who would otherwise speak out in the public square,” as Lee and Glass claim. Rather, the rule limits what psychiatrists can justifiably state in their professional capacity as psychiatrists — not what they can say, as concerned citizens, in the public square. To argue that psychiatrists must choose between violating the Goldwater rule and remaining silent in the face of injustice is to pose a classic false choice. The writer, a clinical professor of psychiatry at Tufts University School of Medicine, is a member of the APA. His views here are his own. In the view of Drs. Bandy X. Lee and Leonard L. Glass, Donald Trump is dangerously unfit for presidential office due to a clear-cut mental disorder. Lee and Glass feel an urgent “duty” to warn the public, and they decry what they regard as cowardly institutional reluctance, on the part of the American Psychiatric Association, to join their crusade. Lee and Glass are spot-on in their diagnosis of Trump as a clear and present danger to our democracy and to the fragile ecosystem of our planet. But they are dead wrong in their psychiatric diagnosis of Trump and in their expectations regarding appropriate APA responses. Trump is bad, not mad, and the tools for containing him must be political, not psychiatric. Incessant and inaccurate psychological name-calling of Trump wastefully distracts from the political task of getting out the vote against him, and it stigmatizes people suffering from mental illness, who deserve a better fate than to be lumped with Trump. It is distasteful to pull rank, but I chaired the task force that produced the fourth edition of the Diagnostic and Statistical Manual of Mental Disorders (DSM-IV) and have written a pile of books and papers on the fine points of psychiatric diagnosis. I couldn’t care less about APA’s Goldwater rule, but I do care passionately when psychiatric diagnosis is misused so carelessly in such consequential matters. The APA should continue to stay mum on Trump’s mental health because it has nothing valuable to add to the discussion. Lee and Glass should do likewise. Voters are key to containing Trump, not psychiatrists. I applaud Drs. Bandy X. Lee and Leonard L. Glass for having the courage to speak out repeatedly regarding the dangers brought on by the madman in the White House (they were far more diplomatic than I). Their willingness to take on the American Psychiatric Association, point out that this is indeed a public health crisis, and examine the truth behind the APA’s “gag order” is an act of integrity. Their courage illustrates the reason we are in this bind with Donald Trump to begin with: Lies and cowardice landed us here. There is a push for truth. Too few are willing to take on Trump and all that he stands for. These two psychiatrists are stepping forward, even if it might put them in professional jeopardy. So many big corporations who benefit from federal funding — and in this case, the pharmaceutical industry is the other elephant in the room — also have gone silent. We have lost our moral compass. I want Lee and Glass to know that they are heard and appreciated during these threatening times. Oh, it must be alarming — psychiatrists say so! After reading that two psychiatrists claim to have affirmed their “duty as psychiatrists to alert the public about” Donald Trump’s dangerous mental state, I affirm my duty as a citizen to alert the public to psychiatrists’ longstanding tendency to attribute pathology to behaviors and attitudes they disapprove of. Many readers probably know that the American Psychiatric Association used to classify “homosexuality” as a mental disorder. But did you know that the APA’s current diagnostic manual includes “often argues with adults” as a symptom of “oppositional defiant disorder” in children? If children had as much clout as adults, maybe “expects unquestioning obedience” would count as a symptom of “power hunger disorder” in adults. And if most psychiatrists were conservative rather than liberal, maybe there would be a “medical consensus” among these “responsible and capable professionals” that psychiatrists who attribute mental unfitness to Trump have narcissistic arrogance disorder.